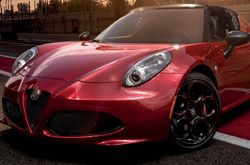 What's New for the 2019 Alfa Romeo 4C? 2019 looks to be a big year for Alfa Romeo as it rolls out its latest 4C model. 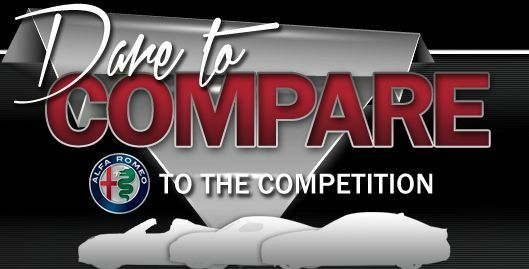 Since its recent re-introduction to the American Market Alfa Romeo has been making noticeable improvements to its impressive lineup. The new 4C model is no exception. The coupe will not be available to U.S. customers, but the sleek Spider (convertible), with no upgrade in price over the 2018 model, will be readily available. While the 2019 model is a continuation of the first 4C introduced in 2015, it does come with a newly standard rearview camera. As previously stated, the 4C comes solely in the "Spider" trim for the American market. The car is distinctly Italian, and if there is one department in which Italian car manufacturers are known to never disappoint, it's design. The sleek, intelligent, and stylish shapes never go unnoticed in any of its models, but the 4C seems to have exceeded sky-high expectations. While the overall look of the car stuns, its numerous subtle design elements tip the vehicle into the realm of pure beauty. Its carbon fiber halo adds even more elegance to cruising with the top down, while its carbon fiber side vents create a feeling of style along with power and modernity. Alfa also looked to add a bit of culture and nostalgia, incorporating carbon fiber mirrors stylized with the Italian flag. When you step inside the 4C and get ready to drive, you will notice that Alfa Romeo did not compromise with its interior design. 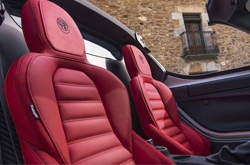 A truly graceful car must have continuity from exterior to interior, and, as usual, Alfa Romeo delivers. The microfiber steering wheel is not just something to gaze at, it's something to feel. 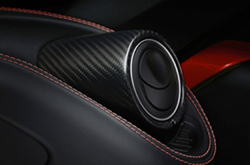 It enhances the driving experience with its refined texture and ergonomic design. In addition, the colored trim on the doors and sophisticated center console provide a sense of classical beauty, while the futuristic speedometer will appeal to the gearhead in all of us. Alfa Romeo knows that it's not enough to amaze with sleek design. Their customers come for style, but they stay performance and driving experience. The 4C is intended to fuse both in the most elegant way possible. Its carbon fiber monocoque chassis, which is both stronger and lighter than steel, ensures that the car stays very light. 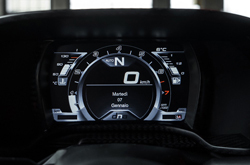 This, combined with its turbocharged four-cylinder engine which boasts an impressive 237 horsepower on an extremely light 2,487 lb frame, allows the car to go from 0 to 60 in a lightning-quick 4.1 seconds and reach a top speed of 160 mph. However, true car fanatics know that driving is not just about going in a straight line. Alfa Romeo has dedicated engineers that have ensured the car handles beautifully while simultaneously allowing for the best day-to-day driving experience possible. How Safe is the 2019 Alfa Romeo 4C? With great performance comes great responsibility. Alfa Romeo knows this, which is why they have packed the car with features that provide the driver with a sense of security. One of its most important features, stability control, makes sure that once the car has reached the limits of its handling it will not slide and put the driver in danger. In addition, anti-lock brakes make sure the car is able to turn adequately under braking. Even though this car is a beast on the road, you can rest assured knowing that it has your back.